We know the feeling – nothing induces a sense of panic faster than drawing a name for a Secret Santa or staring down the barrel of a Yankee Swap. Many of us wind up at the mall at zero hour buying a bath set or a Christmas ornament. Because, really, how are you supposed to find a good gift for that coworker you only chat up in the breakroom on Tuesdays? Fear not! Just follow the RetroPlanet step-by-step guide to holiday office gift giving! Step 1. Draw your name. This is probably the most anxiety-producing part, but take a deep breath and reach into that hat. Did you get the guy you only talk to when the printer jams? Do not panic– I know, it’s the holidays. You have stuff to do, things to buy, there are only lights on half of your house, and the in-laws are flying in from east Omaha. We’ll get through this together. Step 2. If you don’t know anything about the person whose name you drew, then it’s time to go into stealth mode! A quick glance around a cube can tell you a lot about a person. If you see any superheroes, classic rock and roll bands, cars, television characters, movies, or movie stars on the desk or on the walls of your giftee’s office, then go ahead and plug that info into our search engine and you’ll be met with tons of great, and affordable, gifts. Step 3. “But wait, I looked in my person’s cube and all I saw was a stapler!” If your giftee isn’t a decorator, never fear! 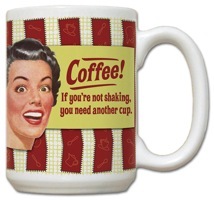 If they’re a coffee or tea drinker, RetroPlanet has a huge selection of hilarious and snarky mugs. So, if the only thing you know about the person is that he or she drinks coffee, and lots of it, you couldn’t go wrong with a Coffee! If You’re Not Shaking Mug. A Duct Tape Coffee Mug is great for the Mr. & Mrs. Fixit's of the office. If you’re buying gifts for everyone in the office, you can take it to the next level and get everyone a mug based on their personality or any scrap of information you know about them. As an alternative, a super original (and affordable) set of gifts that are small enough to fit on a desk without taking up valuable space include retro-style tin banks. They fit the “under $10” price range and are simple conversation pieces.